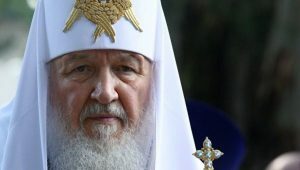 In an interview for Acton’s Religion & Liberty quarterly, the Russian Orthodox bishop in charge of external affairs for the Moscow Patriarchate, Metropolitan Hilarion (Alfeyev) of Volokolamsk, warned that that the situation for the Christian population of Syria has deteriorated to an alarming degree. Hilarion compared the situation today, after almost two years of fighting in Syria, as analogous to Iraq, which saw a virtual depopulation of Christians following the U.S. invasion in 2003. That sentiment has been expressed widely in Christian communities in Syria — some of them dating to apostolic times — as civil war has progressively taken a heavy toll. Now almost two years on, as many as 30,000 people may have perished. Despite having few illusions about the nature of Assad’s autocratic rule, many Christians feared that the Islamist groups, involved in what the West initially viewed as another “Arab Spring” uprising, would eventually turn on them. Indeed this is what has happened. Entire Christian villages have been depopulated, churches desecrated, and many brutal killings have taken place at the hands of the “Arab Spring” insurgents. Most recently, Fr. Fadi Haddad, an Orthodox priest, was found murdered with brutal marks of torture on his remains. Car bomb attacks are now being waged against Christian neighborhoods. (See these backgrounders on the Syrian crisis from the Congressional Research Service and the Council on Foreign Relations). 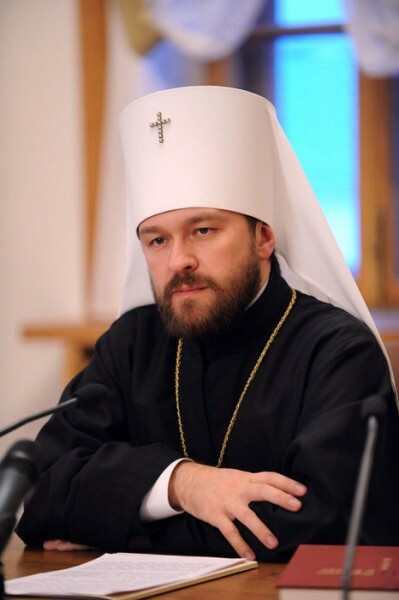 In February, Hilarion delivered a lecture in Moscow titled “An Era of New Martyrdom. Discrimination of Christians in Various Parts of the World” in which he cited the work of groups such as Barnabas Fund and International Christian Concern. In his talk, he detailed the dire situation of the Coptic Christians in Egypt and in Syria, and various other nations. 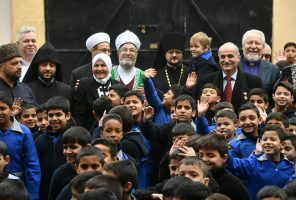 He noted that Muslims and Christians of various confessions – Orthodox, Roman and Syro Catholics, Maronites and Armenians – co-existed in Syria through centuries and that, until recently, “Syria was a model of wellbeing as far as interreligious co-existence was concerned.” What’s more, Syria has accepted 2 million refugees from Iraq, with several thousand of them being Christians, as they fled persecution in their homeland. Last year, Christians made up ten percent of the population of Syria. Today in this country, affected by civil war, tens of thousands of Christians have fallen victim to religious intolerance. Their churches and shrines are being destroyed, they are leaving cities and villages where they lived for centuries, their homes are ruined or captured by the radically-minded representatives of the dominant religion. No less than fifty thousand Christians have had to flee from the Syrian city of Homs. The distinguished representative of Egypt stated a few minutes ago “that the Arab countries respect freedom of expression. One that is not used to incite hatred against anyone. One that is not directed towards one specific religion or culture. A freedom of expression that tackles extremism and violence.” We see, however, that Egypt, with a total population of eighty million people and with a Christian population of about eight million, is facing mass exodus of Coptic Christians because of the systematic persecutions on religious grounds. We call on the Egyptian government to make every effort to stop this persecution and to protect Christians from hatred and violence. Over half of the sixty thousand Christians have left Libya during the civil war. R&L: What, in your mind, needs to happen in Syria to bring an end to the violence and to begin the process of reconciliation in that part of the world? Hilarion: If we look at events which have been unfolding in the Middle East for the last 10 years, we can see a tendency, which is noticeable in many countries. And this has to do with the gradual extermination of Christianity in the Middle East due to various political reasons, due to great political instability, which is peculiar to many countries of this region. I think if we look at the example of Iraq, for example, we’ll see that 10 years ago there were 1.5 million Christians living in that country. Now, there are only 150,000 left. So nine-tenths of the Christian population of Iraq was either exterminated or had to flee. R&L: The situation is also dire for the Copts. Hilarion: We see a very grave situation of Christians in Egypt where thousands of Coptic Christians have had to leave the country because they can no longer live there. We see a very difficult situation in Libya, in Afghanistan, in Pakistan, and now in even Syria. I was recently in Rome addressing the Synod of Bishops of the Roman Catholic Church, and two senior Catholic prelates from the Middle East region approached me. One was a Maronite and the other one was a Melkite. And both of them thanked me for the position of the Russian Orthodox Church and also for the position of the Russian Federation on the international scene with regards to Syria, because the Russian Federation does not take position in favor of one or another party of the country. 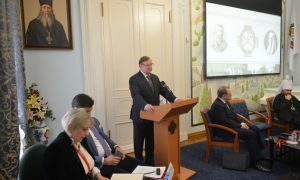 But we believe that all parties of the conflict should be partners of the dialogue. If you simply ignore one party, then it doesn’t lead anywhere. R&L: Are there any areas in Syria now where religious minorities are secure? Hilarion: What we see now is that the inter-religious situation in the regions which are still controlled by the government is stable. It is as stable as it used to be for many decades, if not centuries. In the places where rebels take power, for example in the city of Homs, we see that immediately the Iraqi scenario is being put in practice. We see that Christians are in grave danger. They have to flee; they have to leave their homes. And people from Syria, the religious leaders with whom I spoke, they fear that if the regime is overthrown, then they will have to leave their country. This is what was happening in Iraq. This is what is happening in Egypt. And this is what is likely to happen in Syria. So I think the foreign powers, which try to work for democracy in these countries — in order to achieve it they intervene. They should always think about the Christian minority because it seems to me that these people are simply ignored. Nobody takes into account their existence, their sufferings, and the fact that they become the first victims of the unrest when the political situation changes of these countries. I spoke about this at the Synod of Bishops in Rome. And most recently I spoke about this at the session of the Third Committee of the United Nations in New York. And I cited examples of several countries where the rights of Christians are violated. And I called on the international community to create a mechanism of defense of Christians in the Middle East, in particular, and in other countries as well. And this mechanism should involve the granting of political support or economic aide only in exchange for guarantees for Christian minorities. R&L: Some people are looking at Syria and drawing parallels to Kosovo or Northern Cyprus, places where Christianity is in danger of being destroyed or has disappeared altogether. Yes. Kosovo is another example of the negligence of the Christian population because politicians had their own political goals, which they achieved with the separation of Kosovo from Serbia. But the result for the Christian population was disastrous. I visited Kosovo twice, and I must say that Christians simply left this region. And those who remain, they live in very difficult conditions. For example, I visited one Orthodox Church in Kosovo where four ladies live under the protection of the guards. One lady has her house across the street. For the last four years she could not visit her house even once, because as soon as she leaves the compound, she will lose the protection and she is likely to be killed.